The other day I was desperate for some fresh fruit with dinner, but all I had was a handful of tart baking apples. After scouring my cupboards, I realized that I had absolutely none of the usual ingredients for apple dips or dressings, either, so I improvised. This is a very simple dip/dressing that turned out deliciously—I will definitely be making it again. Soften cream cheese and mix with yogurt. 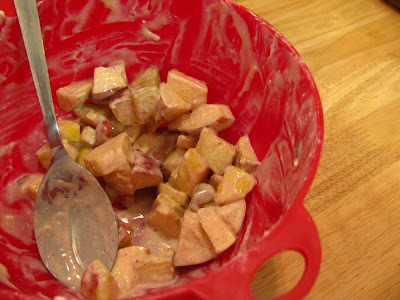 Pour into bowl of diced apples. Sprinkle sugar and cinnamon over top of salad; mix, and enjoy! With a little lemon juice added, this will refrigerate great (covered with plastic) and make a delicious breakfast snack!